Well, how do you improve on that? We asked the same question a year ago when Jody Morris’ Under-18s went into the 2017-18 season off the back of an historic treble-winning campaign. Their answer was to go one better, securing a quadruple success in which they retained all three trophies – including a record fifth successive FA Youth Cup – and added the inaugural Under-18 Premier League Cup to their collection, whilst losing just one meaningful match from start to finish. The aim, of course, will be for the class of 2018-19 to pick up where their predecessors left off, but the youth team is going to look and feel very different this season, and they will have to deal with the challenges that come with stepping up a level. Morris has gone, joining Frank Lampard on Derby County’s first-team coaching staff, and he leaves behind a remarkably successful legacy both on and off the pitch. His assistant, Ed Brand, has earned a promotion to the Under-23 ranks, into a vacancy created by Andy Myers’ hiring as Morris’ replacement. A youth team graduate himself, Myers has been on the academy coaching staff for a decade; starting out with the Under-15s before assisting Adi Viveash and Joe Edwards at Development Squad level in more recent times, whilst also taking a year as first-team assistant at Vitesse. He will be assisted by Jon Harley, a fellow former left-back and Chelsea product, who will move up from the Under-16 ranks along with his new first-year scholars. The team has changed drastically too. 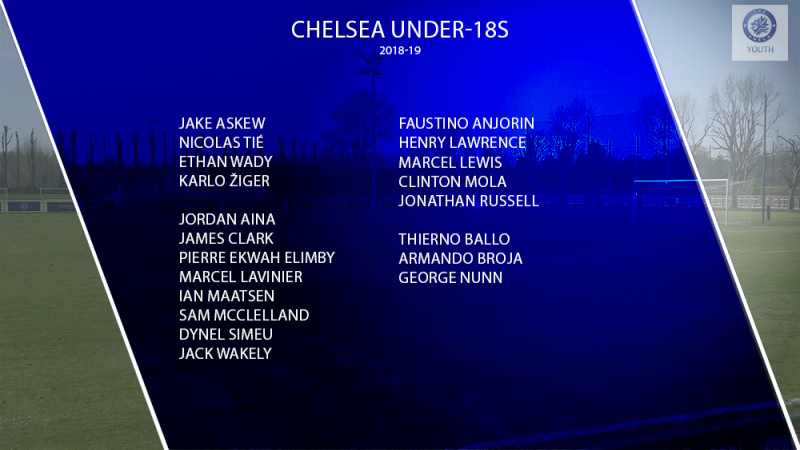 The Youth Cup squad will have a more familiar feel, when Chelsea bring the big guns into the fold, but the significant progress made by the 2017 intake means there are notably fewer second-years around to lead the way for their young counterparts. Callum Hudson-Odoi and Ethan Ampadu are, absurdly, still eligible for youth team football, but will spend the coming months making an impression at senior level, and ten more have graduated academy football and are now too old to take part. Billy Gilmour, Daishawn Redan and Tariq Lamptey have moved up to the Development Squad a year early, whilst Jonathan Panzo rejected the offer of a professional contract, and has signed permanently for Monaco instead. The challenge to the newcomers in replacing their talented elders is exacerbated by the fact that almost all of them are experiencing a full-time programme for the first time, and have plenty of adapting to do both on and off the pitch. The Elite Player Performance Plan, introduced in 2012, made provisions for academies to manage the full-time education of their aspiring footballers from the age of 15 and up (this has since been expanded to the age of 14). Some clubs enter into partnerships with local schools, whilst others – including Chelsea – take that a step further and have teachers from those schools work on-site at the training ground, so as to maximise the time they’re able to spend with the boys out on the pitch. It’s proven to be quite successful both from a football and an academic standpoint at Cobham, but just two of this summer’s fourteen-strong intake were part of that programme, leaving everyone else to find their way in the first few months of their new lives. It’s no easy task for 16 year-old boys who have moved away from home for the first time, and the opening month or two of the season could have a few more bumps in the road than many will expect, particularly in the wake of the near-processional league campaigns of the past two or three years. They’ve enjoyed a largely productive pre-season, with big wins over Oxford and Bournemouth countered by defeats to Anderlecht and Crystal Palace, whilst last Saturday’s triumph at home to QPR saw a team more closely resembling the one that might kick off at Southampton this coming weekend used. Opportunities have been given to almost the entire Under-16 squad to join in over the summer – more on them later – and Myers, Harley, and their new squad have found out plenty about each other. Myers has favoured a 4-2-3-1 formation so far, in contrast to Morris’ preference to rotate heavily between 4-diamond-2 and 3-4-3, but the scope for an academy coach to introduce new concepts and lessons to the players means it’s just as likely to change over the next ten months as it is to remain a constant. It’s also borne of pragmatism based on the players at his disposal but, again, how each individual develops and responds to the challenges laid before them will determine the long-term approach. Chelsea are nothing if not extremely versatile at this level, both in terms of players and staff. Karlo Ziger and Nicolas Tié are the senior goalkeepers available to Myers; the former has been able to take the next step this summer whilst Frenchman Tié recovers from a dislocated shoulder, but they’ll both be asked to take on more of an Under-19 workload with Jake Askew and Ethan Wady expected to handle the majority of league action. Askew has been with the club for a decade and makes up for a lack of ideal size with strong handling and confidence in possession, but the American newcomer Wady has an eye-catching combination of physical and technical skills he’ll be looking to build on. Marcel Lavinier and Jack Wakely are the hold-over defenders from the Morris era, and each captained the team last season, so will be relied upon early and often to handle more responsibility in a younger squad. Lavinier can also operate at full-back but both do their best work in central positions, where new scholars Dynel Simeu, Sam McClelland and Pierre Ekwah Elimby are also competing for playing time. Simeu is a physical specimen who has captained England at Under-16 level, McClelland is a smoother operator with Northern Ireland youth representation to his name, and the left-footed Ekwah Elimby provides a steely balance with impressive size, composure, and technique. Jordan Aina, the younger brother of Nigerian international Ola, can play across the back four but may be forced into more regular use at full-back in the immediate future, where he’ll compete for playing time with James Clark and Ian Maatsen. Clark is an energetic and committed player who is comfortable anywhere on the right, reminiscent in many ways of a younger Todd Kane, whilst Maatsen has perhaps been the standout performer in pre-season. Blessed with supreme confidence in his technique, he covers every inch of grass on the left side of the pitch, and gets forward to consistently positive effect. The former PSV youngster is the likely first breakout star of this group and it won’t take him long to earn a queue of admirers. Clinton Mola and Jonathan Russell endured very different first years as scholars last term; Mola eventually settled into a reliable and underrated option in midfield and at left-back, but Russell suffered with injury and unavailability, and will be hoping to add to his nine appearances with a bigger workload this time around. Mola has donned the captain’s armband in pre-season and cuts a more authoritative figure already, as if keen to shoulder more of the demand placed upon him. Henry Lawrence completes a trio of central midfield options with versatility and a battling mentality. Tino Anjorin and Marcel Lewis were the two players to take part in the club’s full-time education programme as schoolboys last season, and the accelerated progress they saw as a result was tangible. Anjorin grew in stature both literally and figuratively, scoring in the Youth Cup Final in a season where he racked up eight goals in 24 appearances, whilst Lewis made a quieter breakthrough with one goal in half a dozen appearances. They will be relied upon to be the difference-makers; Anjorin’s bullish running and clinical finishing meshed with Lewis’ desire to get on the ball and dictate play will often be too much for opponents to handle, whilst the latter’s prowess from set pieces is an additional weapon in his arsenal. Thierno Ballo arrives from German football with a growing reputation, and has hit the ground running already, scoring a brace against Oxford back at the start of July. Still very raw, his flair and natural creativity draw whispering stylistic comparisons to Hudson-Odoi, but it would be a mistake for anyone to think the Austrian to be as accomplished or as refined as Callum was at the same age. Nevertheless, he has the sort of game-changing ability to finish with double figures for both goals and assists when all is said and done this term. George Nunn joined from Crewe Alexandra as a 30-goal-a-season forward with some similarities to Charlie Brown (they’re both left-footed poacher-types), and he has found the net a few times in warm-up games, despite being stationed mostly out in a wide forward position. The number nine shirt has so far been owned by Armando Broja, a powerfully-built English-born Albanian youth international. More than a pure hold-up player, he’s comfortable moving with the ball, and is an instinctive and intelligent close-range finisher. There’s a nice left-foot/right-foot balance to the side in theory; Ekwah Elimby, Maatsen, Mola and Nunn favouring the former, and it’s been a subtle point of order for the academy squad to be built in such a way. The squad as a whole looks ever so marginally light on numbers in attack, but Myers and Harley may dip into their talented Under-16 group – many of whom are being educated on-site in a full-time programme already – for reinforcements, for there are plenty of options. The schoolboy group, led by James Simmonds, won their own domestic treble last season, and includes no fewer than a dozen players with England youth caps to their name. Myles Peart-Harris and Ben Elliott have both scored goals from midfield this summer, and the former will remind many of a young Ruben Loftus-Cheek with his eerily-similar running style, whilst ex-Swindon defender Charlie Wiggett and Under-16 skipper Lewis Bate have also caught the eye. It’s perhaps the strongest group of academy-developed talent in the last few years, which is saying something given the successes of those that have gone before them, but this is a batch of players who have already achieved plenty and of whom there is far more to come. Myers makes his official debut as the 22nd manager of the Chelsea youth team this Saturday morning away to Southampton, with kick-off at the Staplewood Training Campus set for 11am, and you can keep up to date with everything both then and through the season here at TheChels.net, and on Twitter @chelseayouth.